It's amazing how refreshed you are after a couple of weeks in Hawaii on the taxpayer's dime. President Barack Obama is back at the White House after spending two weeks with his family in Hawaii. 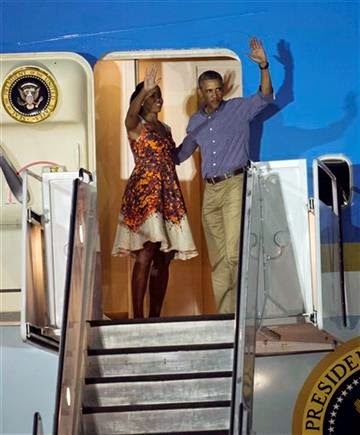 Obama took an overnight flight on Air Force One back from the island of Oahu, where the Obamas vacation every year. Obama was rarely seen in public during the trip and spent his time golfing, on the beach with family or dining in Honolulu’s restaurants. On his last day, he and his daughters visited Pearl Jam’s lead singer, Eddie Vedder. Obama’s public schedule picks back up Tuesday when he meets with Mexican President Enrique Pena Nieto (PAYN’-yuh nee-EH’-toh). Obama will travel later in the week to Michigan, Arizona and Tennessee as he gears up for his State of the Union address on Jan. 20. He’ll face a Republican-run Congress that convenes Tuesday.